Full size images of the winning entries listed below can be seen in our photo gallery. 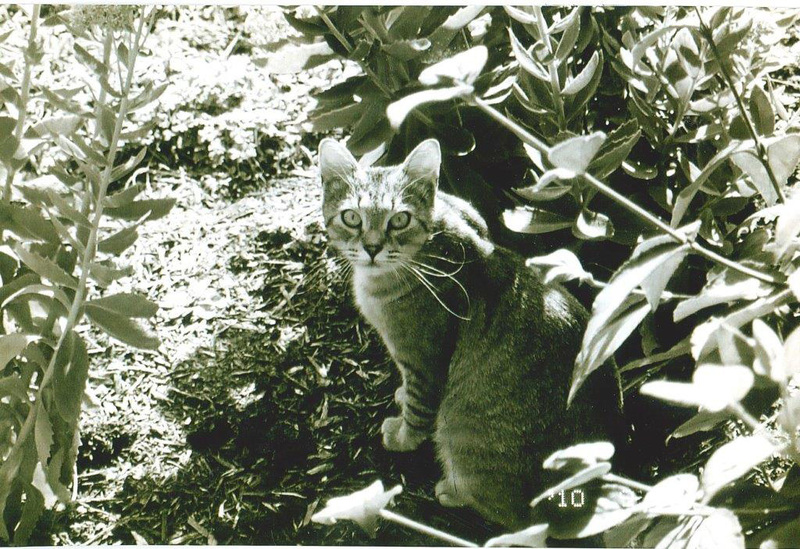 1st Place (tie) - "Garden Kitty"
Farm cat Frances enjoying the garden. 1st Place (tie) - "Good Friends"
Our dog Piper and cat Buster. Buster lets Piper use him as a pillow. 2nd Place (tie) - "Just a Girl and Her Dog"
At sunset watching the stillness at the docks (except for the loons). Stella is a duck hunter, so it was rare for her to have self-control. 2nd Place (tie) - "Miracle of Life"
While visiting Living Treasures with my mom and daughters, we were able to see a baby donkey and his mother just after birth and witness his first steps! It was a special moment for all of us. 2nd Place (tie) - "Dashing Through the Snow"
My horse, Willow, thought she would take a dash through the snow. 3rd Place (tie) - "Seagull Playing in the Waves"
A seagull playing in the waves at Seaside Heights, NJ. 3rd Place (tie) - "Relaxing Day at the Beach"
My wife and I went to the beach at Seaside Heights, NJ – just relaxing, and these seagulls decided to join us. Honorable Mention - "Static Cling"
Giselle, my 4 pound yorkiepoo, laying around with static electricity. Honorable Mention - "Diamond in the Ruff"
Cooling off after a long walk outside; just an extraordinary moment in an ordinary day. 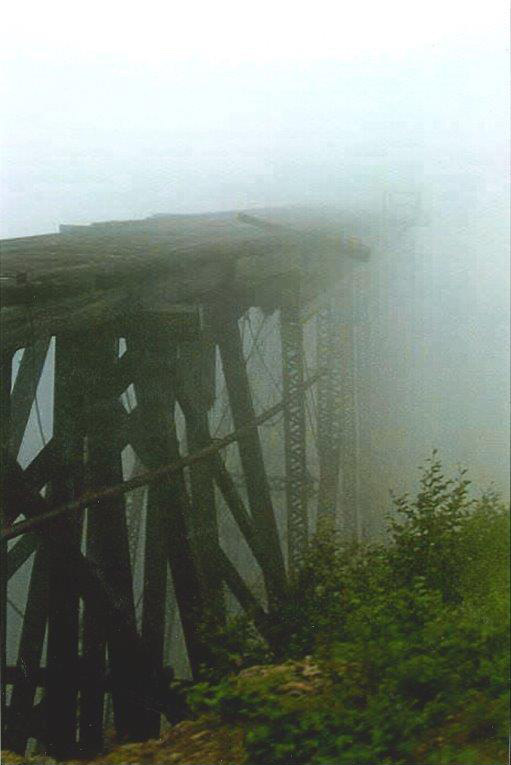 1st Place (tie) - "Bridge to Nowhere"
Railroad Bridge in the fog, Skagway, Alaska. 1st Place (tie) - "Ketchikan Sunrise"
Creek Street, Ketchikan, Alaska. Used to be a red light district, but is now a beautiful shopping area and the creek is full of salmon. 1st Place (tie) - "Gothic Renaissance Architecture"
Rector's Palace was built in the late 15th century for the elected Rector who governed Dubrovnik, Croatia. 2nd Place (tie) - "Lighthouse Steps"
This is the view from the top of the stairs in the Point Loma Lighthouse looking down. 2nd Place (tie) - "Bridge Before Sunset"
On my first trip to San Francisco, CA, I was absolutely fascinated with all the bridges into / out of the city. 3rd Place (tie) - "Suspension in Spring"
Wheeling, WV, historic suspension Bridge over the Ohio River from the city of Wheeling to Wheeling Island. 3rd Place (tie) - "9th Wonder of the World"
A life size Noah's Ark in Williamstown, Kentucky. It is 510 feet long, 85 feet wide and 51 feet high. The life-size Noah's Ark is the largest timber frame building in the world. Honorable Mention - "Holy Family Church, Zakopane, Poland"
The Altar of the Holy Family Church. Honorable Mention - "Piazza San Pietro"
View of the Piazza San Pietro taken from the top of St. Peter's Basilica, Rome, Italy. Commissioned by King Louie IX of France to house his relics, including Christ's Crown of Thorns , it is on Ile de la Cite like Notre Dame and is considered one of the highest achievements of Gothic Architecture. 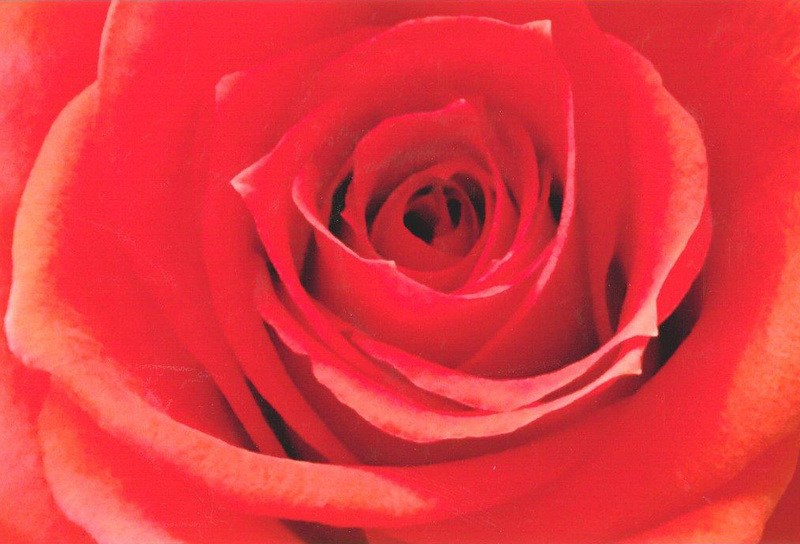 1st Place (tie) - "Majestic Rose"
The spiraling center of the rose shows how there is constant hope for the future. I received the flower as a gift. 1st Place (tie) - "Reflecting in Rocky River"
The white birch trees stand out among the fall colors both in and out of the lagoon (The Lagoons, Rocky River Reservation). 2nd Place (tie) - "Mid-Summer Colors"
Taken outside the main entrance of Lauritzen Gardens, Omaha, NE. 2nd Place (tie) - "Beach Day"
View from under a palm tree on the beach in Playa del Carmen, Mexico. 2nd Place (tie) - "Pollinator"
My town is close to Chicago and has an urban farm with horses. Plenty of wildflowers were planted to attract bees. 3rd Place (tie) - "Night Time Flowers"
Chinese Lantern Festival, Las Vegas, NV. 3rd Place (tie) - "Bees and Sunflowers"
I went to a sunflower path at Jellies Farm and could not help but take photos! 3rd Place (tie) - "Summer Berry Pie"
We saw and picked these delicious berries at a farm with friends. They were great in a pie! Honorable Mention - "Our Slovak Christmas Tree"
Decorating our Christmas tree with Slovak ornaments and signing Slovak Christmas Carols. 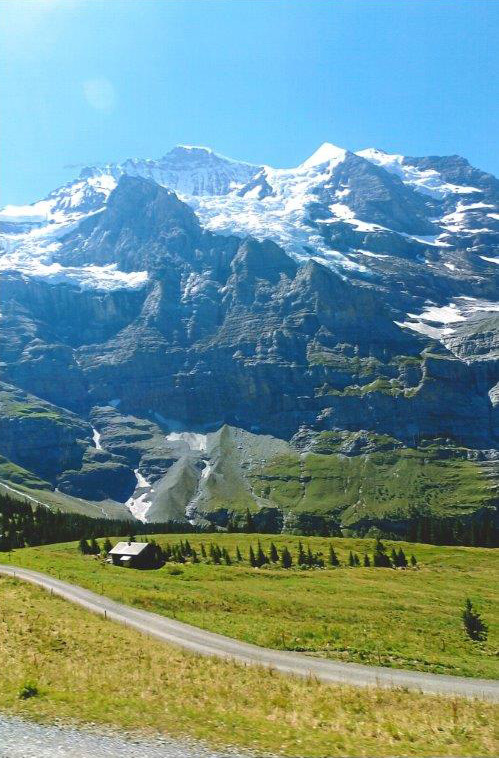 1st Place (tie) - "Mountainside Cabin"
Switzerland, en route to the top of the mountain. Just an idyllic view. 1st Place (tie) - "Serenity"
2nd Place (tie) - "Shoshone Falls"
Twin Falls, Idaho. Shoshone Falls, Niagara of the West, 50 feet higher than Niagara Falls tumbles 212 feet to the canyon floor. 2nd Place (tie) - "Flying over Mackinac Bridge"
A view from out B & B of the Mackinac Bridge with some para-sailors, Mackinac Island. 3rd Place (tie) - "Morning in Saugatuck"
Early in the morning overlooking the Saugatuck Harbor in Saugatuck, MI. 3rd Place (tie) - "Blue Ice"
Mackinaw City, MI. Blue Ice doesn't appear every year. Last time was 2011. Ice only appears blue when it is sufficiently consolidated so that air bubbles do not interfere with the passage of light. 3rd Place (tie) - "19th Century Rustic Cottage"
Still standing in the Great Smokey Mountains. Honorable Mention - "Rocky Mountain High"
After a day of rain, the storm cleared in the evening and provided spectacular views of the mountains at sunset with the clouds below us 12,000ft! Honorable Mention - "A Natural in the Water"
Stella, an English Setter, loves the water and watching for the loons. 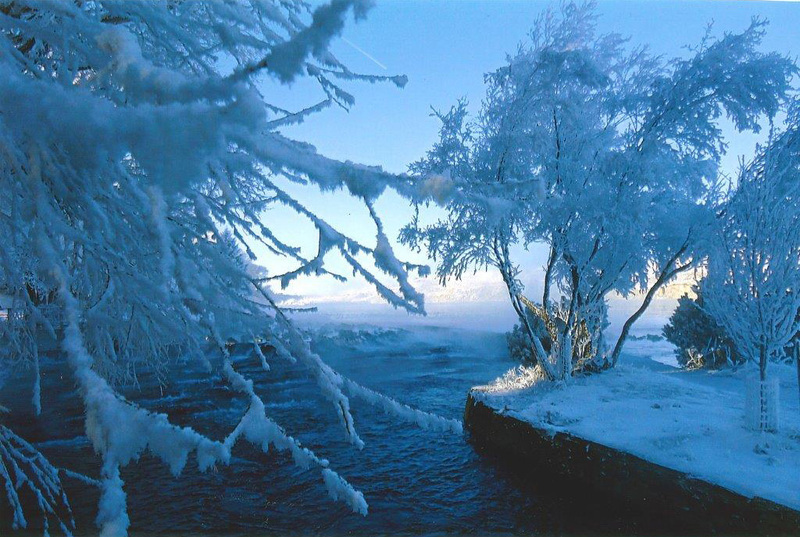 Early morning -20°F at a natural springs along the Missouri River in Great Falls, Montana. 1st Place (tie) - "Forever in Your Arms"
Beautiful stone statue that welcomes you into Clarkson National Cemetery. 1st Place (tie) - "Every day is BEEautiful"
A bumble bee pollinating some flowers in our backyard. 2nd Place (tie) - "Dragon's Breath"
Yellowstone National Park at the Mud Volcano; sulfur smell everywhere. The title should be "Smelly Dragon's Breath." 2nd Place (tie)- "Resting on the Dill"
I went to pick some dill in my garden and spotted this beautiful critter. Good thing I had my cell phone handy before it crawled away and hid. 3rd Place (tie) - "A Natural Frame"
Cascade Head Trail, Otis, Oregon. The pacific is framed by the trees uphill. 3rd Place (tie) - "Sheetscot Pond at Noon"
Sheepscot, Maine. Waiting to take the canoe out for a tour of the pond. 3rd Place (tie) - "Snowy Florida"
Snowy Egrets relaxing in a marshy area at the J.N. Darling National Wildlife Refuge, Sanibel, FL. Honorable Mention - "Reflection of Light"
Honorable Mention - "Evening Embers"
Sitting around the backyard fire pit as the logs slowly burned out. Honorable Mention - "Black Sand Basin Erupts"
Cliff Geyser in the Black Sand Basin in Yellowstone National Park, Wyoming erupting. What a sight! Dark clouds of a snowstorm on the horizon. 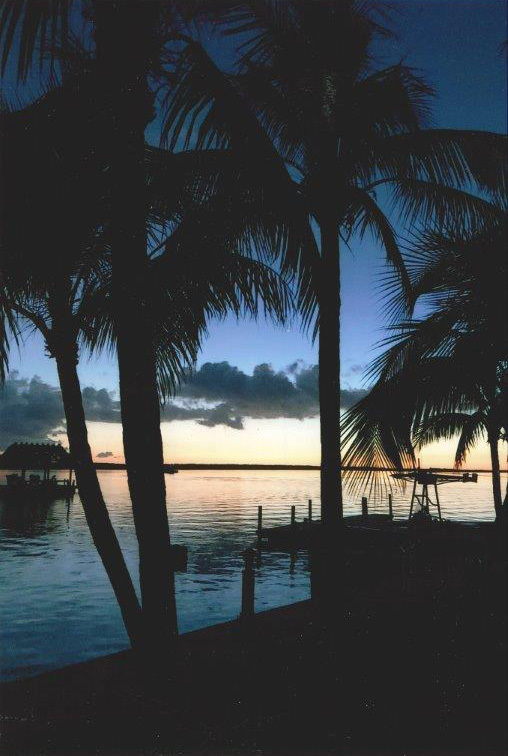 1st Place (tie) - "Paradise"
Paradise found on a 2 day last minute get away to Key Largo, FL. 1st Place (tie) - "Fractured Sky"
This is a 10 second exposure of a thunderstorm lightning bolt from the 7th floor overlooking the bay, Ft. Meyers, FL. 2nd Place (tie) - "Sunset in the Maasai Mara"
Beautiful African sunset on safari in Kenya. 2nd Place (tie) - "Sunrise in Alger, MI"
Summer vacation in Michigan. Woke up early and look at what I see! 2nd Place (tie) - "Molokai at Dinner"
Sunset over the fishing ponds of Molokai. This was my view every night at dinner. 3rd Place (tie) - "Fading Winter"
Taken during spring break in the Upper Peninsula of Michigan. Sunset after some blizzard-like conditions where no one could see anything. 3rd Place (tie) - "A Little Bit of Galapagos Paradise"
View outside our hotel room, San Cristobal Island. Honorable Mention - "Fire in the Sky"
The entire sky was lit up at dusk just as the sun set in Orange Park, FL in winter. It lasted only several minutes. Honorable Mention - "God's Wonders"
This photo was taken from my driveway in Wichita, Kansas, the same night Eureka, Kansas, was stuck by a tornado (6.27.18). "The Peace Maker" - My son, Bill, is a local police officer. 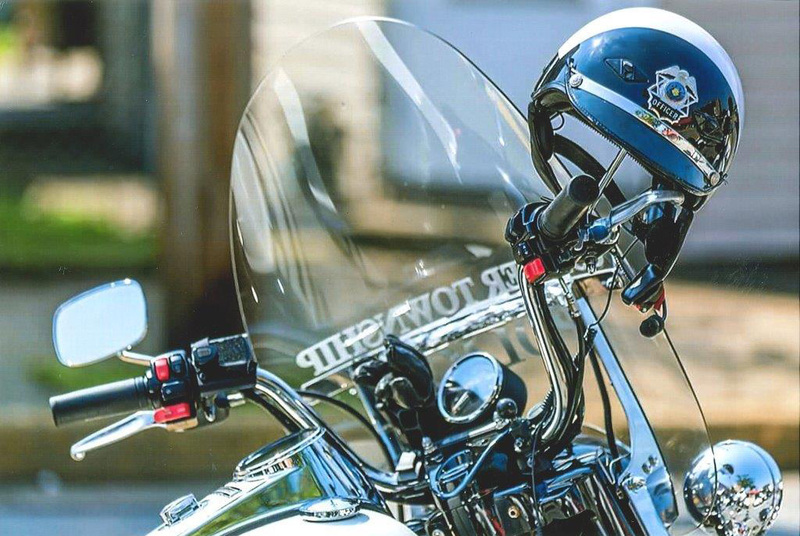 This is the motorcycle he rides for the township. See photos of the winning entries.